Pleasant Living: We have contact... sort of. We have contact... sort of. It is SO nice to be back with you after a writing/blogging hiatus. I didn't realize how much of an outlet this blog is for me, until I was unable to post for so long. Friends, much has transpired since the move. Things have come. Things have gone, and we're still chugging right along in this little journey of life. As I reported earlier, I am a chemotherapy graduate! I am now victorious in my fight with breast cancer, and after 6 long rounds of chemo, I am happy to report that I am feeling great. 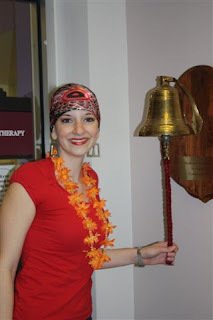 I didn't have pictures to show earlier, but here are some photos of me ringing the bell at the cancer center. Again, I was shocked at what an emotional experience this was. I had no idea the relief that was waiting to pour out of me when I reached up to grab the rope to the bell. It was unbelievable peace, joy in my God, and excitement for the future all rolled into one. To answer the most popular question that I'm getting these days - no. My hair is not growing back yet. To be precise, my head never became completely bald. Sure, for all practical purposes, I look like a billiard ball, but there is a nice layer of peach fuzz residing on my crown. My oncologist told me that it would probably take about 4-6 weeks for me to start seeing any real growth. And, for the second question - yes. I will be sporting a short style. I will NOT continue to wear scarves/hats until my hair is long. As soon as you can clearly tell that I'm a woman, I will be revealing my new locks. I never thought that I'd be one to pull off super short hair, but, then again, I never thought that I'd have a need to. Again, this is just part of the lemonade-making process. You know, "when life gives you lemons..."
I'm glad you're settling in nicely. Exciting times, indeed! And you will look gorgeous with any kind of hair! You do look great! Can't wait to see pictures of your new house, too! You have such good style. Congrats Lindsay! I'm sure your hair will come back as beautiful as it was before all of this. So glad to hear you are well - You look great! so glad you're back! what an exciting time for you. i love the bell pictures...you look fantastic! how is your new house coming along? Congrats, I'm proud of you too! Enjoy the new place. When will we see pictures? WOOO HOOOO! Ring that bell, sista! :) I love it. And you. I love that you posted these pictures! You look so good! You are such an inspiration! 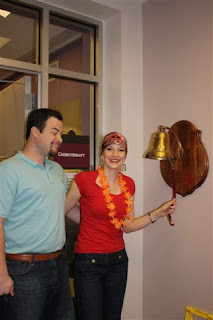 The picture of you ringing the bell gave me goosebumps, so proud of you! Oh Lindsey ~ you look wonderful! Glad you're feel good! Hope you guys are settling into the new house...that's a job in itself...I hate moving! That's a cool thing that the cancer center does. I like that. I'm sure your lovely locks will be gorgeous. Rock the pixie cut!